Are you an educational institute that wants to encourage students to achieve more? Loyalty Gator is your perfect solution. We offer student rewards programs to educational institutions such as schools and tutoring & learning centers. Motivate your students and boost your reputation. It's no secret that getting students excited about learning can be a challenge. Our student rewards program will give them the push they need to want to learn and do well. Students that achieve better results will make your institution favored by parents that want their children to have the best opportunities later in life. "In the modern economy, not graduating from high school is like an economic death sentence. When you're talking about high school kids, what matters to them is what happens today, not what's going to happen a month from now, or six months from now. You have to have a very forward looking mindset...I think most kids don't. In designing incentives to help kids get through school, we have to have that conundrum in mind." - Steven Levitt, esteemed economist and bestselling author. 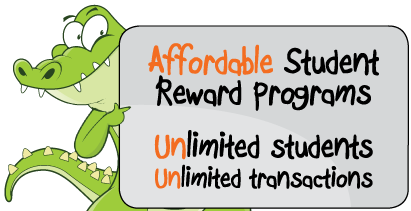 How would you use loyalty gator to benefit your students? Contact Us today to learn more about how a student rewards program can benefit your educational institution.